Outstanding participants of Grand Bahama’s Micro & Small Business Economic Empowerment Programme have been awarded government grant assistance. Minister of State for Grand Bahama Kwasi Thompson, along with Minister of Youth, Sports and Culture Michael Pintard, last week. 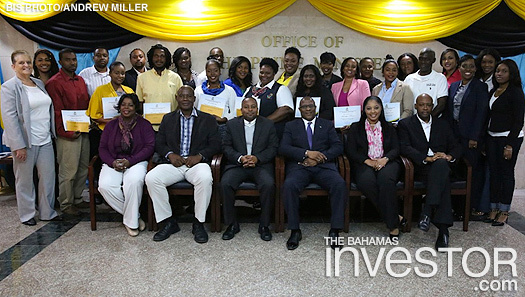 “This small business initiative is designed to create new opportunities for small business development, economic empowerment, and to ignite the entrepreneurial spirit for enterprising Grand Bahamians,” said Minister Thompson, before awarding the winners with a certificate and a grant cheque. Minister Thompson pointed out that the government was careful to design the Micro & Small Business Economic Empowerment Programmeto work in three phases, which would create the most meaningful impact on small businesses. Phase I is a two-week Business Readiness Training Course, designed to expose start-up entrepreneurs, as well as existing businessowners, to business management best practices for the running of successful business operations. Phase II allows qualifying candidates the opportunity to compete with business classmates for the chance to win an available business grant of up to $5,000 for start-up or expansion of their business ideas. Phase III will allow each successful grant winners to be paired with a seasoned business mentor, who will provide expert advice and guidance for his or her start-up or existing business venture over the course of the upcoming weeks. 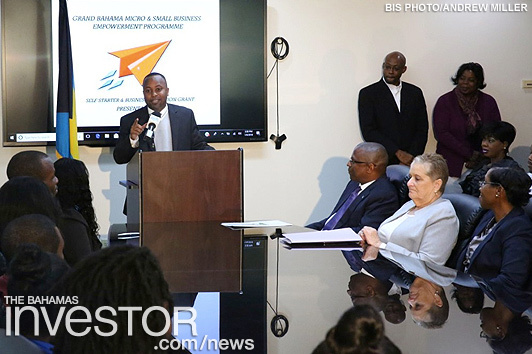 “The persons that you see seated before me today have proven in some small part that they want to be participants, not just merely spectators, for moving the economy of Grand Bahama forward; and I salute their efforts and the future roles we hope they will play within our local business community,” added Minister Thompson. This first session of the Micro & Small Business Economic Empowerment Programme was launched on November 24, 2017 by Prime Minister Hubert Minnis. According to Minister Thompson, the winners of the grants represent just the first session of the programme in Grand Bahama. A second session for new participants is expected to start shortly, on January 15. “But what is even more exciting is the fact that this programme will now go national,” said Minister Thompson. There were 20 winners: five young entrepreneur self-start grant winners — persons who have launched new business ventures; and 15 business evolution grant winners — persons who already own existing businesses and want to grow their enterprises. Indications are that the domestic economy improved modestly during the review month in comparison to 2016, as increased visitor arrivals and a boost in hotel capacity, contributed to gains in tourism output. In addition, construction sector output continued to be supported by varied-scale foreign investment projects. 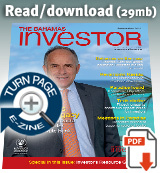 Download the report here.